I’m so happy October is here, Autumn is in full swing! 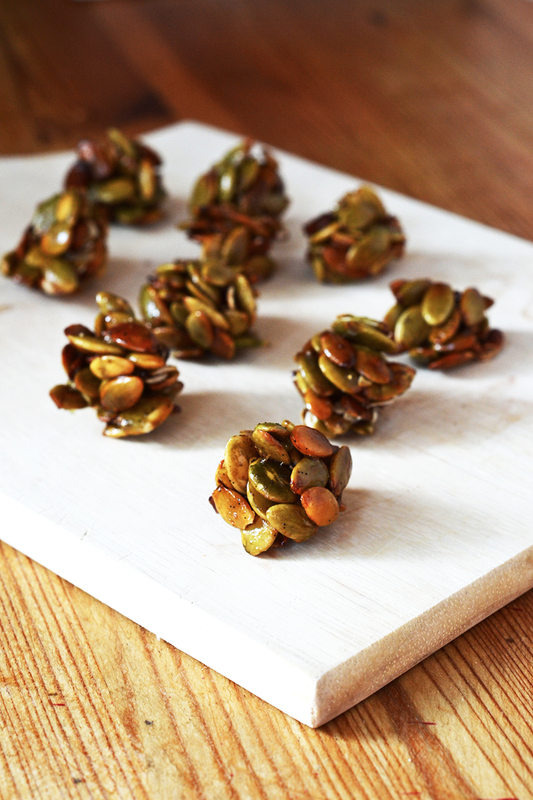 And here is my new favourite seasonal snack: little clusters of pumpkin seeds with a vanilla & honey coating. I wasn’t sure whether to call these “Pumpkin Seed Clusters” or “Autumn Brittle Bites” What do you think? I don’t think they’re hard enough to be called brittle (and you gotta be hard and tough if you wanna be in the brittle gang) but they are very crunchy and sort of remind me of Clusters cereal. The clusters are so delicious munchy and sweet and make a great snack or topping for a breakfast cereal. These are best eaten on the day they are made. I found the (few) leftover ones I had the day after were quite soft, but still tasty! Just to warn you, these are ADDICTIVE. Take out of the oven and leave to cool for a few minutes. Once they've cooled a little (but are still warm) you can press the clusters together to make sure they don't fall apart. They will dry quickly. Once they're cooled and dried, they're ready to eat! Enjoy on their own or served on top of your cereal. Did you make these? We just got the seeds from our pumpkin and am wondering if I have to take the shells off of the seed or if I can keep it on, straight from pumpkin. Yes, I made them. They were delicious! No, you don't need to take the shells off. I got mine straight out of a pumpkin too, and I just made sure the pumpkin was off of the seeds, and I washed and patted them off before starting this recipe. I'd recommend using some parchment paper, otherwise the seeds stick to the pan, and it's really hard to scrape off. Tried these today. Made them without the coconut sugar as I don't like things to sweet. LOVE THEM! Don't stick together to well though. Will try again with the coconut sugar as I don't think they will be too sweet. Does this work without any powdered sugar (just maple syrup or honey)? Am I missing something? The ingredients list maple syrup, but the method says to mix with honey? I can't see honey anywhere here. Do you have any storage suggestions? I would like to make some to have on hand? Hi Nicole, if I remember correctly these don't store too well as they begin to go soft. Perhaps you could try heating the clusters some more on a low heat in the oven, to "dry" them out. How do you get it to stick together? To form a cluster? Just made these for our 8hr road trip tomorrow with my husband and 2 smalls. oh i can see these going very quick. They are so good. I used a bit of water on my hands (cold) to press them together as they kept sticking. Also i read the recipe wrong and made a batch 4 times bigger then stated ( baby brain is my excuse) NOW i am glad i did! Absolutely love this recipe and just shared it on my blog in a Friday Foodie Fave post where I share my favorite recipes finds from around the web. Am I missing something? How does 1/2 cup of pumpkin seeds make 30 servings? Thanks Aimee for your quick response! I used a tbsp to portion them out and I got 5 clusters. Maybe my seeds are bigger? They are tasty and I will be making them again! That's great to hear! I am surprised you only got 5 though, I will have to make them again soon and see how many I get this time... I'll make any amendments if needed :-) Thanks Keri! Love the looks of this! Yum! Wondering what the heck coconut sugar is? And, these are pepitas, correct? The inside seed. I can buy them bulk, salted and unsalted. Thinking salted would be best. Thoughts? Thanks so much! Love your beautiful pics, too! Thanks Mary! Coconut sugar is sometimes also known as palm sugar - it can be found in most health food stores or some asian supermarkets. It's a healthy sugar with a caramel taste but if you can't get hold of it - brown sugar will work just fine :-) These are seeds from a pumpkin and they must be raw and unsalted for this recipe to work. Hope that helps! I am not sure how I missed these, but they look completely amazing and addictive! I can imagine making a batch and then eating ALL of them! Great recipe! Oh, sorry, I saw at the top, it says 30.. So sorry.. Wondering how many clusters it makes? As it says 1 g carb per cluster..
What can I use in place of coconut sugar??? Would love to make these! Thanks A Bunch! Hi Denise :-) You could use brown sugar or really any sugar of your choice! I just chose coconut sugar because it's a slightly healthier option with a caramel taste. Love! Pumpkin seeds are my favourite so this just makes me very happy! These look stunning. I'll definitely be making them this weekend. I hope you do get to make them :D let me know how they turn out if you do! 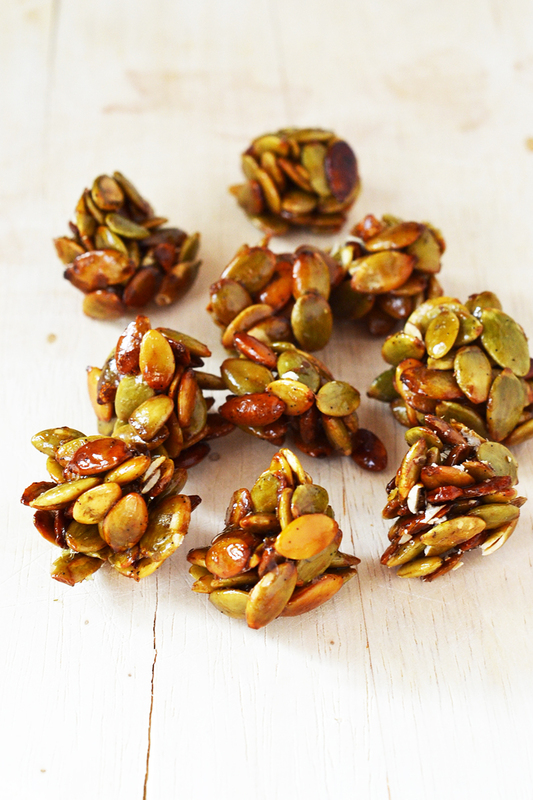 Always in love with new ways to use pumpkin seeds, loving these cluster snacks! Do you use raw pumpkin seeds? Like fresh out of the pumpkin?? Looking for a new recipe to make with the seeds we get after carving our pumpkins this Halloween. They look yummy!! 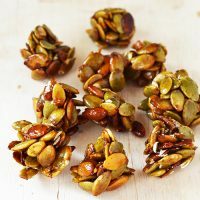 I used packaged raw pumpkin seeds but you absolutely could use the seeds from a fresh pumpkin, would be a great way to make use of them! I would give them a good wash first to make sure all the flesh is removed from the seeds. Hope you get to try them out! This looks like the perfect thing to rescue me from the freezing cold outside and makes me remember that yes, I actually do love autumn! Such beautiful clusters, Aimee! Is it really cold of there at the moment? Today was actually quite mild over here, strangely! But anyway, I hope you get to try these :-) what would you use instead of honey, out of interest? Agave, maple syrup? I was going to mention about the ingredient - but I knew it would be an easy vegan substitution - I always use maple syrup instead of honey. I am not too fond of agave, it isn't as sweet as "honey." It is about 12-15 C here, does it seem cold? In the evenings, it feels like 8-10 C with the gusty winds. Autumn cooking is just bliss!